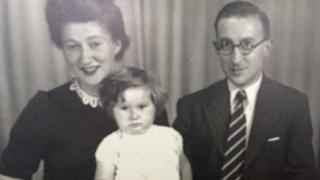 An exhibition about Europe's only internment camp for married couples during World War Two has opened on the Isle of Man. Friend or Foe covers the period between 1941 and 1945, when the first camp of its kind was established in Rushen. It tells the story of Elfrieda and Kurt Munzer, Jewish refugees brought to the island after fleeing Hitler's regime in Holland. Their daughter said her parents had "bitter sweet memories" of that time. Baroness Ruth Henig added: "It was a traumatic time. My parents left Holland on the day the country surrendered to Germany. "They escaped on a stolen lifeboat and were picked up in the North Sea by a warship which then brought them to Dover. "That was the beginning of their time, first as prisoners and later as internees." During the war, thousands of people were held in internment camps on the Isle of Man. Some were political detainees or suspected spies, but many were innocent refugees who had nowhere else to go. Baroness Henig, a Labour Party politician, told how her father and mother were initially considered "enemy aliens" and imprisoned in Pentonville and then Holloway prison. A few weeks later they were taken to the Isle of Man and housed in segregated internee camps, with Mr Munzer in Onchan and his wife in Rushen. Baroness Henig said: "My mother had only been married for about a year and she found the separation very difficult. "Over the next year they exchanged hundreds of letters, many of which I still have today." At the outbreak of World War Two there were around 80,000 people in Britain who were considered potential "enemy aliens". It was feared there might be people acting as spies, or people willing to assist Britain's enemies in the event of an invasion. The UK government asked the Isle of Man to accommodate people at camps in Douglas, Ramsey and Peel. Political prisoners were detained in high security camps, but most internees - including many Jewish refugees - were free to go shopping, swim in the sea and attend classes. A few months later a mixed camp was established in Rushen and the Munzers were one of the first couples to benefit. "Finally they were brought together again at a boarding house on the beachfront," Baroness Henig added. "It was a great relief to both of them." A spokesman for the exhibition said: "Rushen Camp was run by civilians not the military. The owners remained there with their families, so internees could shop, go for walks, bathe and attend classes". The exhibition runs at St Catherine's Church in Port Erin until 24 August. Admission is free.